The client was looking for a new ad agency that really understands the needs of HVAC and home services contractors, to increase service leads and brand awareness in the market. They wanted consumers to know they are the highest quality service provider in the area; giving back and being a part of the community was also a factor. The client needed a company that could not only evaluate their current marketing strategy, but enhance their long term ad strategy by focusing on a stronger radio campaign. They also were looking for a more effective Google Adwords vendor that could deliver better results. We're the HVAC, Plumbing and Home Services marketing experts - here's how we moved the needle for Pacific Aire! Simplified their Broadcast Radio advertising and their Digital advertising by hiring our team to do it all under one roof for More consistent, more effective marketing! As the new SEM vendor, we improved lead gen and click through performance by 3.5 times national average, putting them ON TOP in top keyword searches! Added our Live Chat product to client website to increase the conversion of visitors into sales leads, resulting in leterally HUNDREDS of new leads in the first 90 days. Created custom Branding Jingle- press image to play. There have been significant results across several areas. 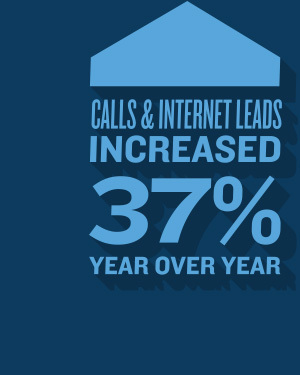 Their online lead generation has increased 37% with our SEM pay per click management. We improved the quality and results and the placement of google ads, increasing clicks and leads sent directly to their website OR directly to a CALL NOW feature for smart phones. The LIVE CHAT tool we provided for their website is helping close more leads daily from the increased traffic we created. The Radio ad campaign created a much stronger brand position for Pacific Aire as a provider of heating and air service, and as we evolve- multiple Home Services. Owner reports callers often sing the jingle or mention Kaleigh the WOW girl in the radio ads. Client has since renewed for a second year, and expanded our scope of media services for them! "We're incredibly happy with what Steve and his team have done for Pacific Aire. His marketing workshop helped sharpen our brand and what makes us different. They created our "WOW! service" position, a new jingle that is stuck in everyone's head- and a clever radio campaign that is working out great. They also negotiated annual radio buys and saved us money on rates. We would recommend Steve's Agency to any HVAC or home improvement company."